Amazon River dolphins are the only river dolphins kept in captivity, mostly in the United States, Venezuela, and in Europe. However, they are difficult to train when compared to the common bottlenose dolphin, for instance, and they don’t survive long n captivity. Their conservation status is Data Deficient under the IUCN Red List for Endangered Species. Life expectancy in the wild is unknown, but in captivity 10 to 30 years. The Amazon River Dolphins is the largest among river dolphins with an adult male averaging 2.5 meters (8.2 feet) in length. The female of the species average about 2 meters (6.6 feet). This species are considered as slow swimmers. Therefore, they average between 1.5 to 3.2 Km/h (0.93 to 1.99 mph), while some have been recorded swimming at up to 14 – 22 Km/h. Due to their solitary nature, this species of dolphins hardly pose any danger to people. In fact, when close to human beings they are noted to be much calmer than other species of dolphins. However, considering that much about these dolphins is still unknown, it’s always advisable to err on the side of caution. Human interaction, on the other hand, poses a danger to the survival of this species. The Amazon River dolphin is commonly caught and injured by commercial fishing nets. Also, fishermen in the Amazon River who find it in their nets end up killing it. Furthermore, in trying to chase away these dolphins from their catch, fishermen often resort to vicious tactics that severely injure and kill the dolphins. This species of dolphins has an incredibly 40 percent larger brain capacity than the average human being! The Amazon River dolphin is considered as one of the most intelligent of all the river dolphins in existence. Female Amazon River dolphins mature sexually between the ages of 6 to 10 years while their male counterparts do same between the age range of 7 and 10 years. Unlike most species of dolphins, mating in this species is seasonal. Courtship involves the male nibbling at the female dolphin’s flippers. Previously thought to have been monogamous, various studies have pointed out to scars on male bodies as being from fights for the attention of different female mates. The gestation period among these dolphins is 11 months. Offspring are born between May and June during the flooding of the Amazon and Orinoco River basins. Newborns weigh about 6.8 kg (15 lbs.) with an average length of 0.8 meters. Calves remain with their mothers until about 2 to 3 years of age. The Amazon River dolphin is adept at solitary hunting. Despite that, there are instances where pods of up to 30 individuals hunt together. Hunting groups are more common where there is an abundance of prey. Also, hunting in groups helps protect them from being preyed upon, especially during the dry season. Like other dolphins, they use echolocation to locate and identify prey and scan their environment. Even so, their clicks are of a slightly lower sonar range of between 16 to 170 kHz. Studies suggest that this is due to the shallow and rugged nature of the Amazon River. Using a higher sonar range would lead to distortion of prey location in such waters. These dolphins have a very varied diet when compared to other toothed whales. They’ll eat up to 53 different species of fish including: croakers, catfish, tetras, freshwater crabs, river turtles, and piranhas. Captive dolphins have been known to share food an indication of a similar trend in the wild. The species major threat comes from human activities within the Amazon basin. A good number of these dolphins are killed every year by fishermen for various reasons. The reasons range from injury due to accidental fishnet entanglement to use as bait for carnivorous species of fish such as the Piracatinga. However, the destruction of the Amazon River basin and the surrounding forests remains their biggest challenge. Destruction of its natural habitat will certainly lead to a reduction of its suitable range, change in breeding patterns, and reduction in food reserves for the species. The IUCN classifies the species within the Data Deficient category due to lack of comprehensive data to determine its numbers. Though, the International Whaling Committee (IWC) has in the past stated that the population of this species is large. The IWC also stated that there is no evidence to suggest a worrying decline in numbers. But recent events are putting this animal under pressure. Countries like Brazil, Bolivia, Venezuela, Peru and Colombia have laws in place to protect these dolphins. Organizations such as the WWF also work towards conservation strategies for this species. Though it’s illegal to kill botos (Amazon River dolphins), local fishermen kill them with spear, harpoons, and clubs then use the dead meat to bait large quantities of the piracatinga catfish. 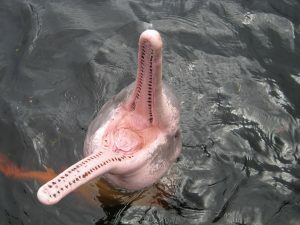 The Amazon river dolphin belongs to the Inia genus and it has three subspecies: Inia Geoffrensis Geoffrensis, Inia Geoffrensis Humboldtiana and Inia Geoffrensis Boliviensis. The Inia geoffrensis geoffrensis dwells within most of the Amazon and Araguaia river basins with an exception being the upper Teotonio rapids in the Bolivian Madeira river basin. The Inia geoffrensis boliviensis, on the other hand, dwells within the Teotonio rapids in the basin of the Amazon River with the Inia geoffrensis humboldtiana inhabiting the basin of the Orinoco River, within the Apure and Meta rivers. Various studies strongly suggest that the Inia geoffrensis boliviensis may be a distinct species. This is based on differences in skull morphology and DNA sampling conducted across all the three subspecies. All the subspecies live only in the freshwater rivers within the larger Amazon basin. They inhabit the shallow and slow sections of the Amazon and Orinoco rivers. 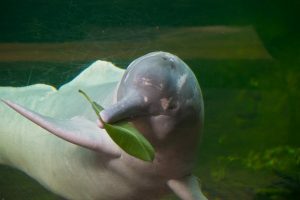 Amazon River dolphins migrate during flood season, in search of food and calmer habitats. There are still many facts about the Amazon River dolphin that are not yet very clearly understood. Nevertheless, with continuous study, it certainly promises to reveal more interesting details as time and research fill in the gaps.